Some promising first light feedback Dave, thanks! So far from what i'm hearing, it has very slight EOFB, slightly less sharp than the ES68 but mnore comfortable to use. I wasn't clear if you felt the unbarlowed 22mm had a sharper edge correction than the ES68 20mm in your refractor... Also, What did you mean the field stop was sharper in the OL22 vs the ES68 20? My ES68's field stop is sharp as a knife edge. Olivon should really fix or remove that silly huge "1.25" text on their eyepieces. It's unnecessary information that clutters the look of the EP making their packaging look amateurish. Just my $.02. I double checked my short comments to make sure I hadn't indicated otherwise, but my impression is that the Olivon seems to be just as sharp as the ES68. There seems to be some slight EOFB, but sometimes there did not seem to be any. This is one of those things that I really need more time to be certain about. I think that is the main point and why I mentioned it at all. Usually the EOFB is immediately obvious if the eyepiece has it to any distracting degree. So while I saw some evidence of low level EOFB it is very mild. I have found that while the ES68's have a "sharp" field stop, they are not quite perfectly sharp. If you look directly at the ES68 field stop you may notice a slightly grainy edge to it - as if it just needs to be a fraction of a mm moved inward or outward. I find this with both my 28mm and 20mm ES68's. This is not something you will notice unless you look directly at the field stop. In a normal viewing it seems very sharp on the periphery, but a number of eyepieces I have are sharper. But it is not fuzzy by any means either. The Olivon has a perfectly sharp field stop. This really is an inconsequential difference. Of more importance I felt it was easier to take in the view to the field stop with the Olivon than with the ES68. The Olivon seems to draw you in to the field stop ... "Here I am! Now relax and enjoy." (Note: personification of field stops is an early sign of needing to go fix dinner). 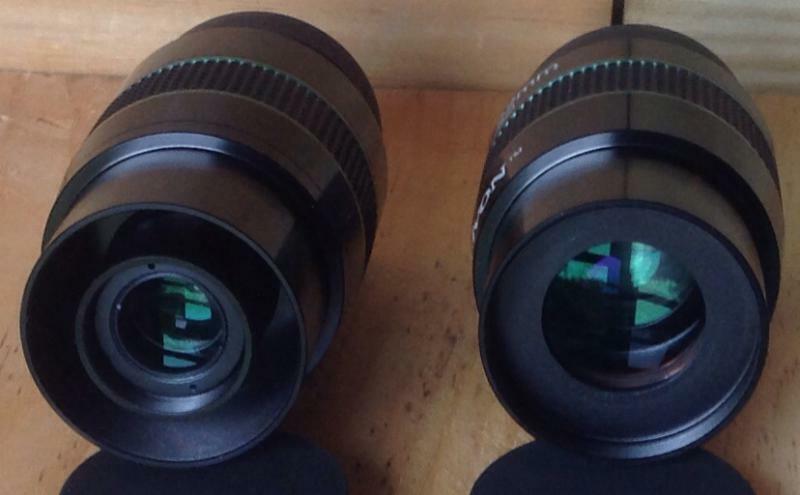 Yes they're the same as; AT AF 70, Celestron Ultima LX and Arcturus Ultimate 70. Starman1 (Don) had done a comparison of a few these clones not too long ago if I'm not mistaken and prefered the Olivon. I thought so! I think Phillip Creed did a review on the 22mm on here, IIRC, and there was some falloff near the edges like my 17mm Ultima LX. The 17mm Ultima LX was extremely comfortable to use with no blackouts, and in need of a Paracorr more then the 22mm or 17mm Vixen LVW. I've used both the 17mm and 22mm LVW w/o a Paracorr, and Those are excellent eyepieces! I'm liking what I'm hearing about Olivon. I wonder if the other focal lengths perform as well, as well as their other models with a narrower AFOV. They might suit me just fine for now. Yes - now I'm considering picking up another FL. I'm just trying to decide which one and whether or not I would be just as well served by barlowing the 22mm. With the extension tubes I have and my 2" Dakin barlow I can get: 36x (no barlow), 87x, 97x, 109x, and 120x. I have an AT 70 AF and it is one our favorite EP's. It's our goto for M42. Comfortable ER and the large eye lens makes it a pleasure to observe with. I cannot comment on how well corrected it is because our main scope is an 8" F8 reflector. Most Ep's are well corrected. --reduce astigmatism at the edge of the field induced by a shorter f/ratio by effectively lengthening the f/ratio before the rays enter the eyepiece. --increase spherical aberration depending on the distance of the focal plane of the eyepiece from the focal point of the negative lens. --vignette the field if the field of the eyepiece is large. --improve the seeing at the power derived by its use. If a fixed power eyepiece sees seeing issues at that power, adding a barlow to a lower power eyepiece will too. --can be used as a "poor man's zoom" if the eyepiece can be fixed at varying distances from the lens of the barlow. --can produce high power views with the eye relief of lower-power eyepieces. In this era of long eye relief eyepieces in short focal lengths, this may not be as important as some pluses for a barlow, but to the owner of Kellners, Plossls, and other eyepieces where shorter focal lengths equals shorter eye reliefs, this can be a great thing. Try the barlow and see. You may find additional eyepieces around the focal length of the doubled power may not be necessary. Could you point the eyepiece at Jupiter and check for eye glint, and point it at the Moon and the area immediately around it to check for glare and reflections? I had it on Jupiter tonight both unbarlowed (36x) and with the 2" Dakin barlow (87x). I saw no evidence of eye glint at either magnification. Last week I mentioned seeing some eye reflection when looking at the Moon. I did not see any evidence of that reflection tonight. The 22mm Olivon provided very crisp lunar views. Features were sharp until they drifted to the last 10% of the FOV. Falloff in the last 10% was not that significant. The eyepiece is very comfortable and there are no issues with blackouts. I also was out right after the Moon set at 3:45am and had a good 45 minutes to check out the summer Milky Way. The 22mm Olivon provides a very natural view. The eye naturally settles into the sweet spot and the field stop is sharp. The field provides a very clean view. Sounds to me like you have a Keeper there, Dave! I wouldn't mind if he tries the whole series actually. This could be the eyepiece series that perfectly complements my 35 mm Paragon. I don't know about the whole series, but I'm considering trying out the 13mm and 8mm which would give 61x and 100x with my scope. Last night I was barlowing the 22mm to 87x and other eyepieces too and the atmosphere was turbulent enough that 87x was about as much as you could have and get reasonably steady views. So I'd rather barlow the 13mm and 8mm to higher magnifications when seeing allows than get the 5mm and 3.5mm. The 32mm is redundant since I have the 28mm ES68. And the 17mm sits between the 13mm and 22mm and isn't really needed ... at least not yet. 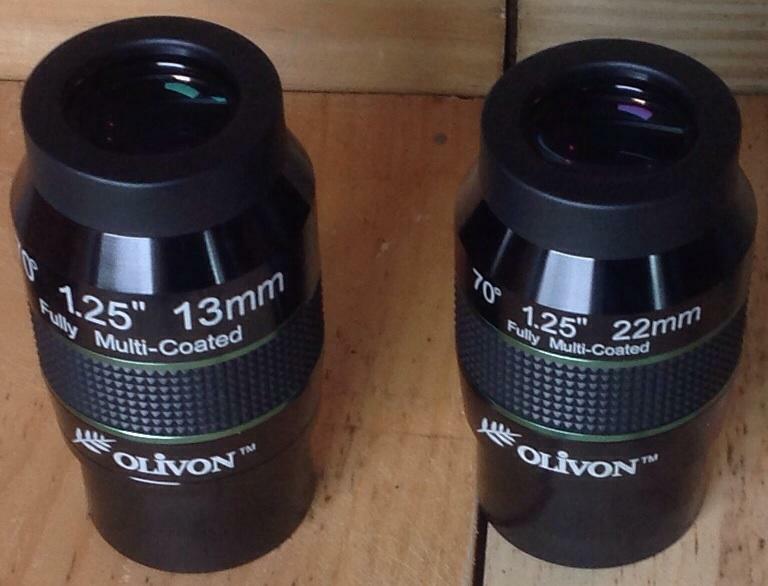 Anyone find specs for all Olivon eyepiece models, especially eye relief? The only thing I see is 20mm ER for the 70* models. What about the 58* (60*?) models, and others? Even the home site doesn't tell. The information is found in the Eyepieces Buyer's Guide at the top of the Eyepieces Forum, as well as on several commercial sites. How does it do with no barlow? I have a f/7 refractor and am considering the Olivon 32mm 70deg for my low power needs. I'm also considering the 28mm ES68 or a used 27mm Pan. The don't mind going less expensive on my low power eyepiece because my % useage at that focal length is low. I tend to use it for old favorites ... Veil, double cluster, Pleides, and comets or cruising the milky way. My scope is a petzval achromat, but the 22mm Olivon is sharp until the last 10% of the FOV. It is very similar to the 28mm ES68 for edge performance - probably a little better. --to have a trace of vignetting in the last few degrees of field. The first was indicated by a trace more refocusing necessary at the edge once the center was focused, compared to the 22. One should note that many 30mm + eyepieces display a similar amount of FC and need to be focused half-way to the edge instead of in the exact center. I have found this true of widefield eyepieces from Baader and TeleVue. The second, astigmatism at the edge, also found in the 22, could be being induced by the f/5.4 optics in the TeleVue. The design may not handle the shorter light cone as well as a longer one. Again, this is far from unique, and its correction in that regard is average for the price range. The third thing, vignetting, as I see it, is because of a large amount of 2" barrel below the field stop, and because of the shape of the barrel between the bottom lens and the field stop. To explain: The field stop is a ring that is threaded into the 2" barrel (it's adjustable!) but stops at a step-down in the diameter of the inside of the barrel. Thus, the I.D. of the barrel is slightly smaller than 48mm between the field stop and the bottom lens. And the bottom lens is significantly larger in diameter than the field stop. That means the light cone passing through the field stop will not illuminate the edge of the lens fully. Though far from unique in widefield eyepieces, it does mean the very edge of the field, viewed at an angle, is a little less bright than the center. To my eye, it resembles the 24mm Hyperion or 35mm Parks Gold/Ultrascopic in that regard, and it's a sign the manufacturer pushed the design to its limits. I see a field stop of 40mm or a couple tenths larger, which is larger than the 31 Hyperion, but smaller than the 31 Nagler. I have not used this at night, yet, so I will reserve judgment. Often, things that are issues in daylight viewing are not at night, when your pupil is larger. Conversely some nighttime issues are unimportant during the day. If it's clear tonight, I'll try it on the Moon and some star fields. Please correct me if I'm wrong, but it sounds as though the 32mm has an accessible external field stop before the field lens, while the 22mm has a Smyth Lens then the field stop? That's how it appears. Looking at the eyepiece, I doubt the 32mm has a negative lens assembly at all, and therefore fewer elements. I really didn't see how that the 32mm could be a Neg/Pos without a big increase in size - And Cost! Would like to know how these are in a fast reflector! Let me know how this ep works as a low field ep for DSOs. Evaleating an ep for sharpness on Luna with a barlow is nice, but before I plunk down a few hard earned coins on an ep, I'd want to know if this galss will be eble to pick off the real subtle stars that might be otherwise teased out with overted vision. I want an idea just how sharp and dense a globular cluster presents itself to the observer with the Olivon vs. An ES68. I want to see them pop out from a jet black background and not just wander into view as my eye pans the view. I've been waiting for really good skies to do that. I did get a nice look with it the other morning, but not enough time for a real evaluation. Based upon what I have seen so far it seems to present very nice sharp star images and it was as good or better than anything else I have for nebula such as M27, M17, M8. But I need a good night for a more formal evaluation - not the hurried 45min I had before the Sun began to wash out the sky the other morning. Great service from Don BTW! Less than 48 hours after ordering it was in my hand all the way from the west coast to upstate NY. Those look really nice Dave!